Darren Hughes was one of the central figures in the Farney’s impressive league campaign. 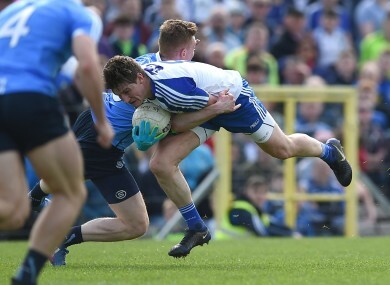 MONAGHAN’S HOPES OF challenging for the Ulster title have taken a huge hit with the news that key midfielder Darren Hughes will be sidelined for 12 weeks with torn medial ligaments. The Irish News reports that the 30-year-old suffered the knee injury after a collision in a game for his club Scotstown on Saturday. Hughes visited the sports surgery clinic in Santry on Wednesday and scans have revealed the extent of his injury. The midfielder will be forced to undergo surgery if the injury fails to respond within the next four weeks, which would rule him out for the year. Hughes is almost certain to miss the Farney’s entire provincial campaign, which opens against Fermanagh on 20 May. “It’s not the cruciate so I suppose that’s kind of a bonus,” he told the Irish News. “At the minute I don’t need surgery – they were afraid of a full rupture but they don’t think it is so. I’ve just to look after it and hopefully it’ll heal well. The42 is on Youtube! Tap the button below on your phone to follow us! Email “Monaghan suffer hammer blow as knee injury could rule Hughes out for the entire campaign”. Feedback on “Monaghan suffer hammer blow as knee injury could rule Hughes out for the entire campaign”.